If you are interested to learn about one of the most important parts in the respiratory system, get Facts about The Lungs. Can you imagine if the lung is broken? You will not be able to survive. You cannot breathe without the lung. Therefore, you have to avoid smoking cigarette and protect your lung from the air pollution if you want to stay healthy all of the time. Every single day, the lung can process more than four million litres of air. There is no need to wonder that it can hold one litre of air continuously during the respiratory process. Pulmonology is the study of lung. There are many diseases which can affect the health of our lung. Some of them include lung cancer, Bronchitis, tuberculosis, emphysema and pneumonia. You can decrease the risk of having lung cancer if you do not smoke cigarette. Let’s find out the origin of the word lung. It was derived from the 13th century European language. The meaning of lung is light. This organ is named lung probably because it is very light due to the small size. There are two lungs inside the human body. The location of the light is above the diaphragm and below the windpipe or trachea. The rib cage and muscles protect the lungs. You can find alveoli inside the lungs. The alveoli are the tiny air bags which can remove the carbon dioxide and carry the oxygen to the blood when you breathe. Do you know that there are more than 30 million alveoli inside the human lungs? Let’s find out the size of lung. 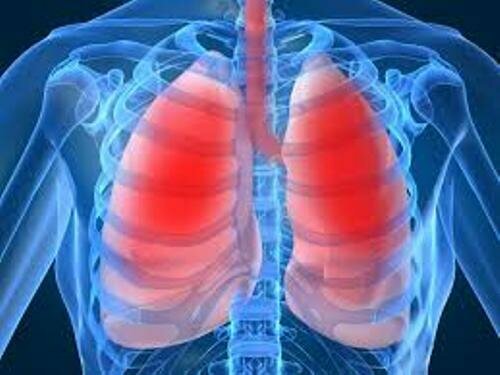 The adult lungs come in the width of 10 till 15 cm, the weight at 0.8 till 1.2 kg and the length at 25 till 35 cm. The right lung is bigger compared to the left lung. The people who have the unhealthy lung will find out the dull, bumpy and black lung. If you check out the healthy lung, it has the shinny, smooth and pink color. Check another important human organ in kidney facts. In average, human breathes 23,000 times. Even though our lung is small, it has the total surface area around 70 till 100 square meters. The only organ which floats on the water is the lung. Find out another organ in Liver facts. Asthma is one of the common diseases which affect the lung. 1 of 12 American people has asthma. Are you satisfied with facts about the lungs?